Back when I first got into Disney photography, it seemed like I went into each trip with one really ambitious for a difficult/interesting photo. During our August 2009 trip, it was this photo of SpectroMagic. I had never before seen a long exposure done of Walt Disney World’s nighttime light parade, and thought it was a really novel idea. Since then, shots like that have been done many times, including other versions by me from different locations in the Magic Kingdom. Still, that spot at the Main Street USA Train Station remained my favorite, but it always filled up so early that I never had a chance to try it again. Finally, this April while the flagpole was down (this normally only happens one weekend per year–for the filming of the Christmas Day Parade–so it was a big deal for Disney-centric photographers like myself), we camped out with a couple other photographers to photograph the fireworks without the flagpole obstructing our view. Since the Main Street Electrical Parade occurred before the fireworks while we were waiting, I figured it was the perfect time to try the shot with a fisheye lens, something I didn’t own back in 2009. While my first try had the benefit of being original, I think this is the better photo. It captures the energy and motion of the parade better, shows more of the crowd, and has a nice blue sky. I think that sometimes it’s worth revisiting old shots like this. Not something I’d want to make a habit of doing as I think it’s not the best way to grow as a photographer, but it can be fun sometimes. 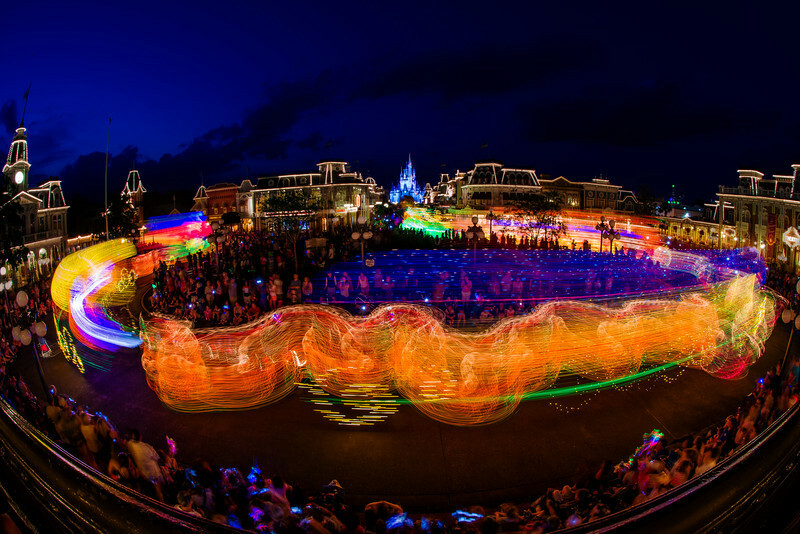 In any case, this photo is of the Main Street Electrical Parade and that photo was of SpectroMagic! BIG DIFFERENCE! Photographed with a Nikon D600 and the Zenitar 16mm f/2.8 full frame fisheye. This was shot in bulb mode (36 seconds) at f/20. I’m often asked how I determine the length of the exposure in situations like this, and it really is just a matter of making an educated guess. You have to know the baseline exposure time that the scene, if static, should have, but in cases with fireworks and other moving lights, it’s more complicated than that. The reason it’s more complicated is because the brightest light sources are moving through the frame, and potentially duplicated in the same location. This makes the likelihood of having blown out spots greater, so the key to getting good exposures in these circumstances is memory of where your light sources are appearing in the frame, and for how long. With the light parades, it’s pretty consistent, as the floats normally move along the same path, but sometimes there’s a stoppage with a really bright float or lit-up character being in the same spot for a while. This is the most important aspect of shooting photos like this. In post processing, I used Adobe Camera Raw to adjust the white balance, open the shadows, and tame some highlights that were a bit unruly. I then opened the image in Photoshop CS6, where I used a saturation adjustment layer to de-saturate Cinderella Castle (it had color bleed issues–common with this long of an exposure), and do a curves adjustment to make it pop. Processing was actually pretty minimal here. The big thing about these long exposures is getting it right in camera and then making sure the highlights are in check and there are no color bleed issues. What do you think of this photo? What about revisiting old photo ideas, trying to improve upon them? Thoughts on the age old debate of SpectroMagic versus Main Street Electrical Parade? Please share your thoughts in the comments–it’s always great to hear your thoughts! Love the photo. When you are adjusting curves to make the photo pop…what parameters do you look for…change? Good question! When doing the curves adjustment, I look for a spot in the photo that I want to be pure black and using the black dropper tool to select it. Then I do the same with white. I usually do *not* do the same with the grey tool. That is an excellent way to get the colors accurate, though. Beautiful work. The long exposure, the composition, the fisheye, the lack of flagpole…it’s all there. This makes me excited for that fisheye I ordered (based on your recommendation). Not that I think I could nail a shot like this, but it reminds me of all the cool possibilities awaiting me! Great shot. It’s a shame I hate this parade. Actually I guess it’s just I loved Spectro and since this replaced it and led indirectly to its demise in storage, I hold a grudge against this parade. Still a cool photo. On question… Is the size of the castle from a pin cushioning effect by the fisheye, or does it just really look that small from that perspective? The size of Cinderella Castle is a result of both pin-cushioning and the distance.